[PHOTO] ‘로피시엘 옴므’ 5월호의 커버 모델, 김재중! 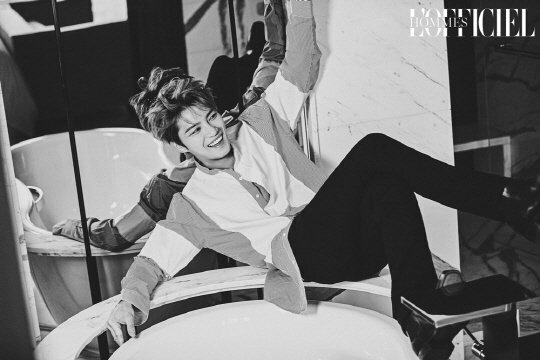 ‘L’Officiel Hommes’ May issue’s cover model, Kim Jaejoong! [PHOTO] 로피시엘 옴므 5월호 표지는 몽환적 눈빛의 소유자 가수 ‘김재중’ 입니다. 여심을 자극하는 김재중의 더 많은 화보와 인터뷰를 로피시엘 옴므 2017년 5월호에서 만나보세요. L’Officiel Hommes May issue cover is singer ‘Kim Jaejoong’, owner of dream-like eyes. You can check out in L’Officiel Hommes May 2017 issue more of the pictorial & interview of Kim Jaejoong who quickens women’s hearts. [Loffy Cover] L’Officiel Hommes May issue cover is singer ‘Kim Jaejoong’, owner of dream-like eyes. You can check out in L’Officiel Hommes May 2017 issue more of the pictorial & interview of Kim Jaejoong who quickens women’s hearts.